Alcohol Abuse in College Students: Warning Signs, and Prevention Tips. Alcohol abuse is a common feature of the college “party culture,” as we can see in movies, on TV, and in the news with regularity. What many college students don’t know is just how dangerous alcohol abuse is, and just how quickly abuse can turn into alcoholism. College students can avoid the devastating consequences of alcohol addiction if they are educated about the dangers and warning signs, as well as ways to avoid unhealthy behavior. However, not so many of them ask the question “What is alcoholism?” to their friends, family, and themselves. 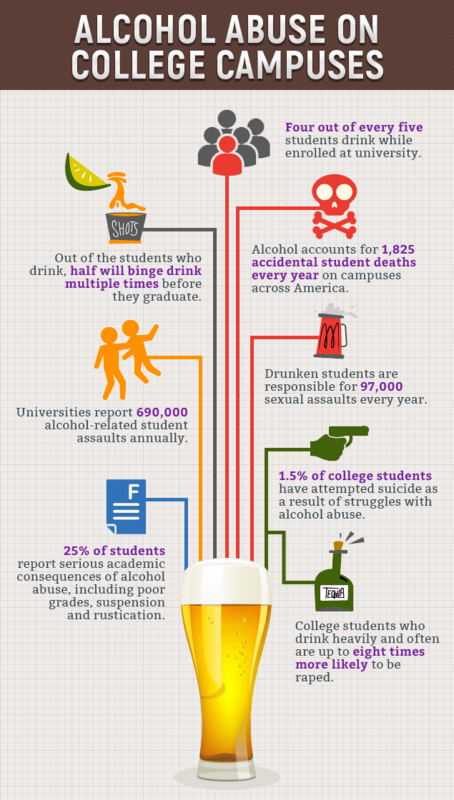 How Common is Alcohol Abuse in College Students? Four out of every five college students experiment with alcohol in college. 40% of all college students ages 18 to 22 have engaged in binge drinking and about 12% of college students ages 18 to 22 binge drinking on five or more occasions per month. College alcoholism can negatively affect a student’s performance in class, get them in trouble with the law, lead to addiction, and even endanger their lives. 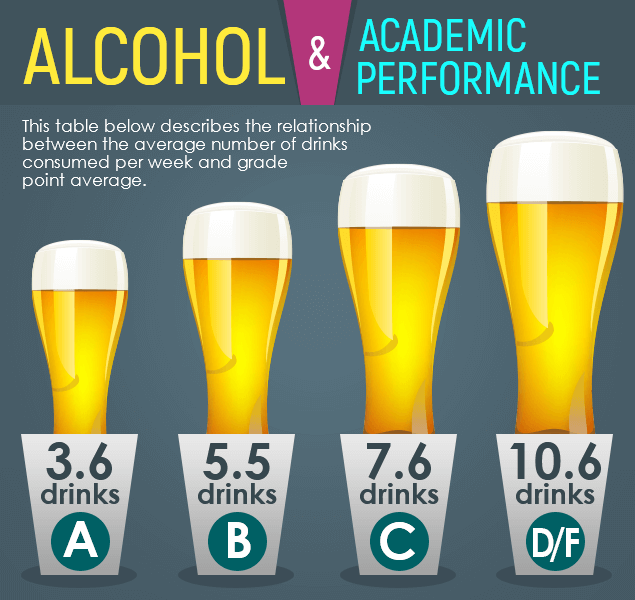 The NIAAA reports that 1 in 4 college students experience poor performance in school due to alcohol, especially among binge drinkers who binge drank at least three times per week. When under the influence of alcohol, a person may commit crimes that he or she would never dare to if sober because of impaired judgment. Researchers estimate that 110,000 students aged from 19 to 24 are arrested each year for an alcohol-related offense, such as public drunkenness or driving under the influence. In a 1991 study of 12,651 U.S. college students conducted by the Towson University Campus Violence Prevention Center, researchers found that out of students who admitted to destroying or damaging campus property, 60 percent of those students also said they were under the influence of alcohol at the time. A different study in 1991 of 4,845 students from 68 U.S. colleges and universities found that one in ten students had engaged in vandalism in the past year. Furthermore, almost 25 percent of students classified as heavy drinkers reported engaging in vandalism. Based on information gathered by University of Albany’s School of Criminal Justice Hindelang Criminal Justice Research Center in a study conducted between 1995 and 2002, out of students who reported experiencing theft involving force or the threat of force in and around their college campus, an average of 38% of students surveyed said that alcohol was involved in the incident. At ages 19 and 20, approximately 19 percent of college students reported that they had driven drunk in the past year. In the two years following their 21st birthdays, this number of college students who admitted to driving drunk in the past year rose to 23.5%. When students were 19 and 20 years old, an average of 45% reported that they had driven a vehicle after consuming alcohol within the past year. In years 21 and 22, more than six out of every ten students surveyed reported driving after drinking alcohol. At 19 and 20 years of age, two out of every five college students reported having ridden in a vehicle with a driver who was drunk in the past year. At ages 21 and 22, throughout the year, half of all college students had ridden in the car with a drunk driver. The average cost of getting a DUI, or Driving Under the Influence charge, (OVWI, or Operating a Vehicle While Intoxicated, in some states) in the United States ranges anywhere from $5,000 to more than $20,000. However, this cost does not include that of lost lives if the drunk driving incident results in a fatal accident. A DUI conviction always includes fees and the suspension of one’s driver’s license and can include jail time and probation. Researchers estimate that each year, 696,000 college students between the ages of 18 and 24 are assaulted by another student who has been drinking. Out of students who reported experiencing threats of physical violence in and around their college campus, on average, nearly half (48%) of the students said that alcohol was involved in the incident. Out of students who reported experiencing actual physical violence in and around their college campus throughout the seven years, an average of 57% said that alcohol was involved in the incident. Consuming alcohol puts college students at a higher risk of sexual abuse. Drinking alcohol causes a person to become less aware of his or her surroundings, lose the ability to think clearly, and lowers levels of physical coordination which makes it more difficult for that person to defend oneself against an attack or assault. According to a nationwide Washington Post-Kaiser Family Foundation poll, 25% of female college students and 7% of male college students reported they had been subject to unwanted sexual advances during their time at school. Two-thirds of these victims had been drinking alcohol around the time of the incidents. Because consuming alcohol lowers a person’s inhibitions, a college student is more likely to engage in sexual activity if he or she has been drinking than if he or she had not been drinking. Alcohol consumption can lead to life-changing consequences including the contraction of a sexually transmitted disease (STD) or an unplanned pregnancy. Alcohol-related injuries can include cuts, bruises, fractured or broken bones, muscle sprains, concussions, and more serious injuries like ones resulting from an automotive accident. Alcohol also thins the blood, making it more difficult to stop bleeding in a person who has been injured. Any college student who abuses alcohol is at a much higher risk of becoming an alcoholic. Alcoholism is a serious addiction that creates a range of legal, financial, professional, and family problems for individuals who develop this dependency. Seeing as the human brain is not fully developed until a person is in his or her mid- to late-twenties, alcohol abuse can have extremely damaging effects that may hinder a college student’s brain from reaching full development. As a result, the longer a college student’s alcohol abuse problem goes unaddressed, the harder it will be for him or her to beat alcoholism later on in life. Researchers estimate that approximately 1,825 college students die annually due to unintentional alcohol-related injuries, included automotive accidents. Alcohol poisoning is another risk college students face, especially when they participate in a large amount of alcohol over a short period—so much so that their blood alcohol level is considered to be toxic. A person becomes incapacitated, and if he or she does not receive treatment relatively soon, death occurs. Alcohol and depression treatment is a dangerous combination. It is possible for college students who suffer from forms of depression or anxiety to feel an increased sense of distress and hopelessness when consuming alcohol. Because alcohol use decreases a person’s overall decision-making abilities, a person who suffers from depression or other mental illness may be more prone to attempt or commit suicide under the influence of alcohol. How Do College Students Become Alcoholics? The transition from high school to college is a difficult one for many young adults. The first six weeks of school are crucial in determining how a college student will adapt to the pressures of meeting new people, fitting in with a new group of peers, possible homesickness, and other sources of stress. Unfortunately, many college students turn to alcohol to alleviate the pressures of fitting into this new environment. College students who live in their own apartment, especially close to campus, are also at a high risk of alcohol abuse simply because it may be their first real taste of “freedom”; a person who has been living under the rules of his or her parents may feel the need to experiment with drugs or alcohol simply because he or she can. Without parents around to deter this behavior, college students often allow their alcohol use to get out of hand. College students who live with their parents are less likely to develop an alcohol abuse problem that those who do not. It is not uncommon, to say the least, for events or gatherings organized by college students (not school-related) to have alcohol openly available to all who attend, even those below the legal drinking age. Students may feel pressured in some way, if not directly then implicitly, to drink if they want to fit in with their new peers. Another reason college students start drinking and binge drinking is because many of them, especially those who are now living away from home, now have large amounts of unstructured free time and less “adult” supervision. This newfound freedom causes some students to experiment with things that were previously forbidden to them, such as alcohol or other illegal substances. The introduction of multiple sources of stress all at once can sometimes cause college students to develop alcohol abuse problems as an unhealthy way of dealing with these adult-like pressures. How College Binge Drinking and Alcohol Abuse Turns into Alcoholism? Approximately 20% of college students meet the medical criteria for having an Alcohol Use Disorder, which includes alcohol abuse and alcohol dependence. Not all college students who binge drink end up becoming alcoholics, but they are only a step or two away from developing alcoholism, also known as alcohol dependence. The National Survey on Drug Use and Health defines heavy drinking as having five or more drinks on one occasion at least five times within the past month. The Center for Disease Control (CDC) and NIAAA define heavy drinking, or “high-risk drinking,” as having more than eight drinks for women and more than 15 drinks per week for men. A study published by researchers from San Diego State University’s Department of Psychology and The Scripps Research Institute found that young college students who engage in binge drinking on more than three occasions within a two-week period are statistically 19 times more likely to develop alcoholism than non-binge drinkers. How To Prevent College Students from Alcohol Abuse? Regrettably, there is no 100-percent-guaranteed way to prevent college students from alcohol abuse. However, parents and educators can help prepare students for the culture shock of entering college by educating them about the consequences of alcohol abuse and teaching students about alternative ways to cope with stress. Colleges and universities can help curb alcohol abuse by setting appropriate examples, providing alternative recreational activities, and establishing consequences for alcohol abuse. Parents and schools should educate adolescents and teens about the dangers of alcohol as soon as it is appropriate. Often the only things that young adults know about alcohol is what the media shows them: the party scene, people dancing, laughing, and having an amazingly fun time. If a college student knows the real consequences of drinking alcohol and alcohol abuse, he or she may be less likely to develop a problem. Adult children of alcoholics need an additional attention. Stress is a huge reason that many people, including college students, develop an alcohol dependency. If college students are taught different ways to deal with stress, they may be less likely to seek out alcohol for its mind-numbing effects which only temporarily eliminate worries or troublesome thoughts. What to Do If a College Student Has Become an Alcoholic? How can one tell if a college student has developed an alcohol abuse or alcohol dependency problem? If any of these signs become apparent in a college student, friends and family members should take it upon themselves to talk to the student about his or her drinking habits, and what will likely happen if he or she continues to abuse alcohol. It is also important to figure out the real causes of alcohol abuse. Unfortunately, not all college students will be willing to listen or accept that they have a problem. If the intervention resonates with the college student, sometimes support from friends and family may be enough to help the student curb his or her drinking problem. In some cases, though, treatment may be the best option to help a college student get his or her alcohol abuse problem under control.